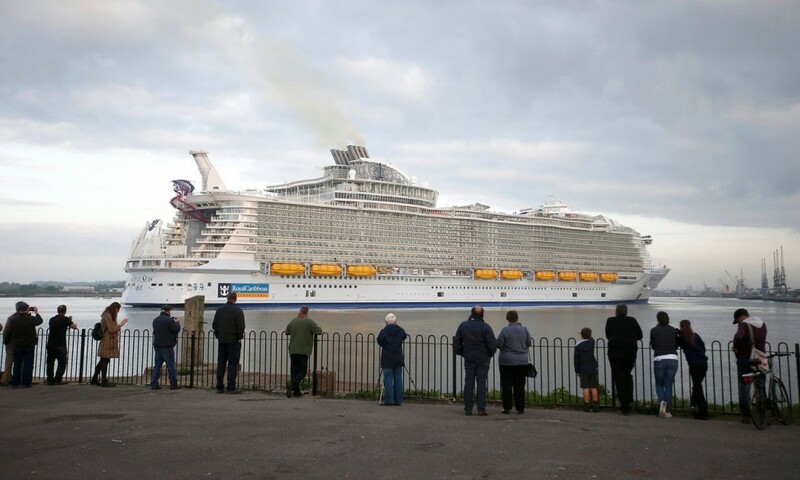 When the gargantuan Harmony of the Seas slips out of Southampton docks on Sunday afternoon on its first commercial voyage, the 16-deck-high floating city will switch off its auxiliary engines, fire up its three giant diesels and head to the open sea. But while the 6,780 passengers and 2,100 crew on the largest cruise ship in the world wave goodbye to England, many people left behind in Southampton say they will be glad to see it go. 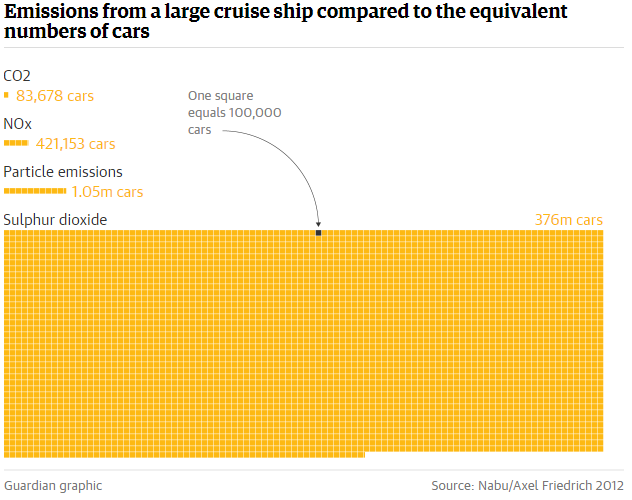 They complain that air pollution from such nautical behemoths is getting worse every year as cruising becomes the fastest growing sector of the mass tourism industry and as ships get bigger and bigger. The Harmony, owned by Royal Caribbean, has two four-storey high 16-cylinder Wärtsilä engines which would, at full power, each burn 1,377 US gallons of fuel an hour, or about 66,000 gallons a day of some of the most polluting diesel fuel in the world. In port, and close to US and some European coasts, the Harmony must burn low sulphur fuel or use abatement technologies. But, says Colin MacQueen, who lives around 400 yards from the docks and is a member of new environment group Southampton Clean Air, the fumes from cruise liners and bulk cargo ships are “definitely” contributing to Southampton’s highly polluted air. “The liners pollute, but the road traffic that they and the cargo ships generate is also huge,” he adds. Royal Caribbean, the US owners of the Harmony of the Seas, said that the latest and most efficient pollution control systems were used and that the ship met all legal requirements. Industry body Cruise Lines International Association (CLIA) added that companies had “invested significantly over the last decade to develop new technologies to help reduce air emissions”. But marine pollution analysts in Germany and Brussels said that such a large ship would probably burn at least 150 tonnes of fuel a day, and emit more sulphur than several million cars, more NO2 gas than all the traffic passing through a medium-sized town and more particulate emissions than thousands of London buses. According to leading independent German pollution analyst Axel Friedrich, a single large cruise ship will emit over five tonnes of NOX emissions, and 450kg of ultra fine particles a day. “Air pollution from international shipping accounts for around 50,000 premature deaths per year in Europe alone, at an annual cost to society of more than €58bn [ $65bn],” says the group on its website. Nabu has measured pollution in large German ports and found high concentrations of pollutants. “Heavy fuel oil can contain 3,500 times more sulphur than diesel that is used for land traffic vehicles. Ships do not have exhaust abatement technologies like particulate filters that are standard on passenger cars and lorries,” says Rieger. Southampton, which has Britain’s second largest container port and is Europe’s busiest cruise terminal, is one of nine UK cities cited by the World Health Organisation as breaching air quality guidelines even though it has little manufacturing. According to CLIA, the cruise ship industry is now one of the fastest growing sectors in the mass tourism market, with 24 million passengers expected to sail in 2016, compared to 15 million in 2006 and just 1.4 million in 1980. “The industry shows no signs of slowing down. It generated $119.9bn (£83bn) in total output worldwide in 2015, supporting 939,232 full-time equivalent jobs,” said a spokesman. “The luxury sector is seeing the most amazing growth that it has ever seen in its history,” said Larry Pimentel, president of Azamara club cruises. • This article was amended on 23 May 2016. An earlier version said the Harmony of the Seas had three 16-cylinder engines which, if running at full power, would burn 96,000 US gallons of fuel a day. It has two such engines which together would burn about 66,000 US gallons of fuel a day if running at full power, and is understood to have four 12 cylinder engines. The article also said the ship must burn low-sulphur fuel in port and close to some coasts; it can also use abatement technologies to meet emissions guidelines. Vietnam’s ​​​Prime Minister Nguyen Xuan Phuc has approved a national plan aimed at controlling the environmental impacts of shipping through the enhancement of environmental inspections at the country’s ports, as well as an increase in officials and civil servants’ capacities in the state’s maritime management agencies, local media reports. With the goal of fully implementing regulations outlined in the International Maritime Organization’s (IMO’s) MARPOL Annexes III, IV, V and VI of the L, the plan will see relevant agencies conduct a review, beginning this year 2016 and running until 2020, of legal documents regarding the prevention of pollution linked to shipping, as well as the appropriate management of discharge from maritime activities. Further, the plan will facilitate regular vessel inspections that align with regulations contained in Annexes III, IV, V and VI – a process that is said to be intended to fulfill the country’s responsibility in relation to ships registered out of Vietnam – and will work to enhance Vietnamese officials’ capacity in dealing with maritime accidents. The plan also expresses the intention to increase Vietnam’s cooperation with relevant international organisations and other countries within the region, improving information exchange, technical assistance, personnel training, and technology transfer relating to the implementation of the IMO regulations. Until 2030, a study will be conducted under the plan to examine viable investment mechanisms and policies for waste collection systems to be used at sea ports, as well as effective and regulation compliant equipment to monitor sewage and garbage discharged by ships. In March, an inauguration ceremony was held for Vietnam’s international seaport at Cam Ranh Bay, marking the completion of its first phase of construction as part of a national push to transform the port into one of the country’s top deep water ports, and a regional hub for maritime service, including bunkering. Air pollution is an insidious thing. The particulate matter that streams out of tailpipes and power plants contains an extensive list of contaminants—everything from carcinogens to endocrine-disrupting compounds—in addition to the tiny specks of soot we’ve come to associate with the higher rates of asthma and other respiratory disorders seen in populations that live near major highways or industrial facilities. Basically, every part of it is bad for you, and researchers just found two more toxins to add to the list: nickel and vanadium. According to as-yet-unpublished research that is being presented Tuesday at the American Thoracic Society’s 2016 international conference, the nickel and vanadium found in the exceptionally fine-grained class of air pollution called PM2.5 damages children’s developing lungs. And in Southern California, where the research was conducted, these toxins mainly appear in the air pollution that comes from shipping vessels. For this latest research, Robert Urman, a researcher from the University of Southern California, and his co-authors assessed health records from 1,911 elementary school children from various communities in Southern California. Among them, the highest levels of nickel and vanadium in the air were found in Long Beach, California, where cargo chips and other vessels burn fuel oil while leaving and entering the ports of Long Beach and Los Angeles, which combined is the largest seaport in the United States. “When we analyzed the data, we found that teenaged children in the most polluted communities had an estimated decrease of approximately four percent in their lung function compared to similar children in the least polluted communities,” Urman said in a statement. Cargo ships are among the leading sources of pollution on the planet. Starting in 2020, however, stricter sulfur emission standards will take effect. A low-cost solution for reaching the new targets may come from an EPFL start-up, which is developing a nanostructured filter for use in a ship’s exhaust stacks. Around 55,000 cargo ships ply the oceans every day, powered by a fuel that is dirtier than diesel. And owing to lax standards, maritime transport has emerged as one of the leading emitters – alongside air transport – of nitrogen oxide and sulfur. But the International Maritime Organization has enacted tighter emission limits, with new standards set to take effect in 2020. In response, an EPFL start-up is developing a low-cost and eco-friendly solution: a filter that can be installed in the ships’ exhaust stacks. The start-up, Daphne Technology, could do well on this massive market. Under laboratory conditions, the nanostructured filter is able to cut sulfur emissions to below 1% and nitrogen oxide emissions to 15% of the current standards. This is a major improvement, seeing as the new standards will require an approximately 14% reduction in sulfur emissions. Manufacturing the filters is similar to manufacturing solar cells. A thin metal plate – titanium in this case – is nanostructured in order to increase its surface area, and a number of substances are deposited in extremely thin layers. The plates are then placed vertically and evenly spaced, creating channels through which the toxic gases travel. The gases are captured by the nanostructured surfaces. This approach is considered eco-friendly because the substances in the filter are designed to be recycled. And the exhaust gas itself becomes inert and could be used in a variety of products, such as fertilizer. The main challenges now are to figure out a way to make these filters on large surfaces, and to bring down the cost. It was at EPFL’s Swiss Plasma Center that researcher Mario Michan found a machine that he could modify to meet his needs: it uses plasma to deposit thin layers of substances. The next step is to produce a prototype that can be tested under real-world conditions. The idea to solve the problem of toxic gas emissions came to the researcher after working on merchant freighters while completing his Masters in microtechnology. It took several years, some techniques he picked up in the various labs in which he worked, and a few patents for Michan to make headway on his project. It was while he was working in another field at CERN and observing the technologies used to coat the inside of particle accelerators that he discovered a process needed for his original concept. An EPFL patent tying together the various aspects of the technology and several manufacturing secrets should be filed this year.